How did Lev Calder move from an unwillingly escaped Tithe to a clapper? In this new ebook original short story, author Neal Shusterman opens a window on Lev's adventures between the time he left CyFi and when he showed up at the Graveyard. Lev's experiences on a Hi-Rez, an extraordinarily wealthy Native American Reservation introduce him to a teen with remarkable musical talent... and whose gifts are destined to end up in the hands of another. And it is this teen's heart-breaking story that inspired Lev to choose the clapper's path. 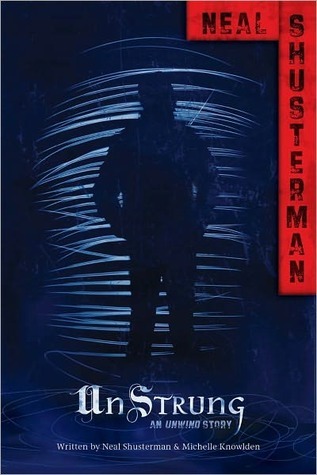 Pulling elements from Neal Shusterman's critically acclaimed Unwind and giving hints about what is to come in the long-awaited sequel, UnWholly, this short story is a must for fans of the series. Unwind is one of my most favorite books of all time, so I just about went through the roof when I found out Shusterman was making Unwind into a trilogy. I got even more excited when I saw that there was a novella between books one and two. UnStrung was the perfect appetizer to tide me over until UnWholly was released. It was a great short story in its own right, but I loved having the sneak peak at UnWholly at the end. What I liked best about UnStrung was the look into Lev's life. Many facts were revealed which gave me a lot of insight into his character. I loved that it takes place in a different setting than the first book, and the look into the lives of the People of Chance. The sacrifice at the end was heartbreaking, but not entirely unpredictable. UnStrung is a must-read for fans of Unwind!